I've started my spring migration headed up the east coast, driving straight through from Florida to North Carolina's Outer Banks to visit Cape Hatteras National Seashore. As I mentioned last time, national seashores are great for people with boondocking capability because almost all the campgrounds are right on the water, they're cheap ($15-20 a night and half that with a Federal Senior Pass), and they're not crowded. The amenities – flush toilets and a sink in the building on the right. The building to the left is the cold shower. Maybe later in the year. In the foreground is a campsite with a picnic table and one of the nifty stainless steel grills. You're not really even boondocking at national seashores – there are picnic tables and fire rings or grills at each spot, a bathhouse with running water flush toilets, beach showers (cold water only) for the adventurous, and fresh water and a dump. Everything is well-maintained – this is the National Park Service running the place, not some local outfit. I was astonished to see that the grills at each campsite were stainless steel instead of the usual rusting hunk of cheap iron. A few solar panels and/or an engine generator and you're set, without all the crowds and expense of commercial campgrounds. 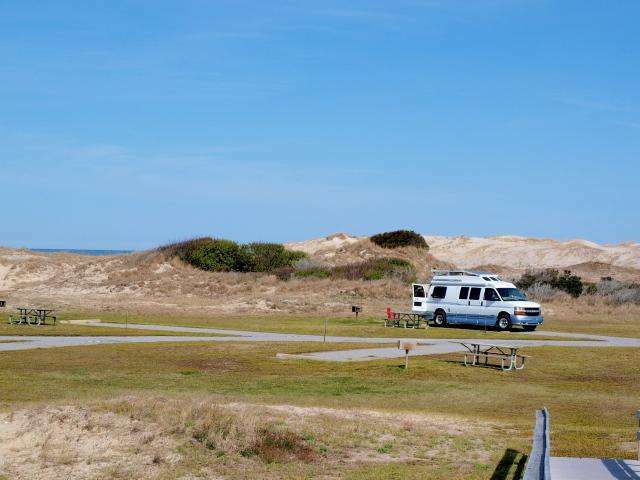 There are four campgrounds here at Cape Hatteras National Seashore – I'm at Oregon Inlet Campground, less than ten miles south of the Highway 64 bridge that connects the Outer Banks to the mainland. There's another 80 miles of precariously maintained highway south of here (the barrier islands are very narrow and constantly migrating, which makes road construction a challenge) down to the southernmost campground, Ocracoke, but with nobody out here this early in the year I didn't feel the need to go to the literal ends of the earth. Needless to say, the hurricane evacuation plan for the southern Outer Banks involves a lot of praying. There's plenty of elbow room as it is. We had an influx of young families and bikers with pop-ups and tents over the weekend, but by lunchtime Sunday it had cleared out. Out my window now I can see four other campers, and there are maybe 100 campsites here. Three of the campgrounds open on the third Friday in April, and I imagine they're really packed on summer holiday weekends, but this shoulder season stuff is more my style. Camp on the oceanward side of the campground, and you can listen to the waves at night, undisturbed by the usual commercial campground noises. There's a line of dunes between you and the beach – otherwise they'd have to rebuild the campground every time there's a hurricane – but it's just a short hike away. Monday after the weekenders have left – my nearest neighbor to the north is over a hundred yards away. Beachcombing is fun here – lots of clams and whelks, not the conchs and other tropical stuff we're used to in Florida. It's still a little early in the season for non-hardside camping. We had a line of severe thunderstorms come through a couple of nights ago, and the tent campers had to pack up and shelter in their vehicles with the 50 mph winds, massive lightning show, and driving rain. Me? I turned around to face the wind, and took the dishes off the tripods. That's it. As the storm blew over and out to sea, the lightning out over the ocean was spectacular. If push comes to shove and a tornado shows up, I like my chances in a 9000 plus pound campervan, rather than some top-heavy Class A or C with a half acre of side profile area. Between showers, though, the weather is beautiful, sunny, with temperatures in the high 60s/low 70s, and the freshest sea breeze you ever smelled coming in off the water. Oregon Inlet is named after the sailing ship of that name which rode out the 1846 hurricane in Pamlico Sound here (between the barrier islands and the mainland), and whose crew were astonished to discover the storm had cut a half-mile-wide inlet right through the barrier island. They have to redraw the maps frequently here, because it doesn't take much to make new islands out of old ones. NC record bluefin tuna – 800 pounds, caught 40 miles offshore. A little weatherproof taxidermy, and it serves as great advertising for the marina. Some of the unusual geology here is due to the meeting of the currents – the Labrador Current comes south bringing cold water, and the Gulf Stream is coming north. They meet and the Gulf Stream veers offshore here. That's what these barrier islands are doing so far out from shore. The mixing of the waters leads to some exciting sport fishing – the marina across the street from the campground has charter boats which, for a mere $1800 a day, will take you out to the dividing line between these two currents, where you can do battle with marlin and giant tuna. Thankfully, much of the big fish sport is catch and release these days. These are 50-60 foot boats with one or two 1000+ horsepower diesel engines, so they're not really gouging you as much as it would seem. We're going to stay here a few more days and let spring catch up with us before we head north. Might as well – no crowds, cheap accommodations, and everything we need to explore deserted beaches at our own pace. Appreciate the insight. Looks like a great place to check out – when it gets a bit warmer! You should drive another hour and go to Frisco NPS Campground. Same amenities but the sites are among the dunes and block the stronger breezes. Or camp on the top on the hill and have a great view of the ocean! i heard good things about Frisco from the locals – less bugs, up high so you can see the ocean from your campsite, and definitely worth the extra drive. i just had a few days so i didn’t bother, but will the next time i’m here. Not far from me……on the bucket list. Thanks!